It's not the kind of selfie most young women would want to be known for. But 27-year-old Tawny Willoughby, a registered nurse in Alabama, posted this graphic photo of herself on Facebook as a warning for others about the hazards of tanning and skin cancer. "If anyone needs a little motivation to not lay in the tanning bed and sun here ya go! This is what skin cancer treatment can look like," she wrote. Willoughby says she spent her teens cultivating the perfect tan, laying out in the sun or using tanning beds four or five times a week, and is now paying the price. She was first diagnosed with skin cancer at the age of 21, and has had six carcinomas removed so far. 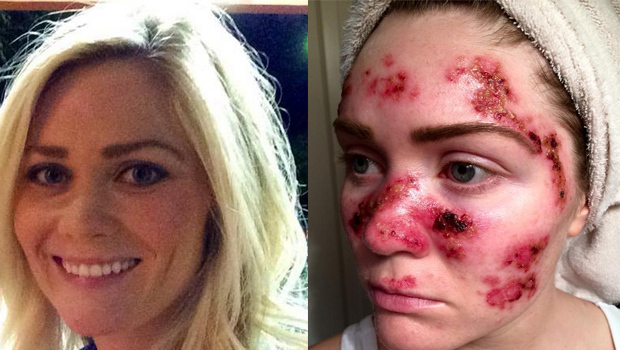 Her selfie, which has now gone viral, shows the damage to her face from another round of skin cancer treatment. In the post, Willoughby says she's had basal cell carcinomas five times, and squamous cell carcinoma once. Both are usually treatable but can be disfiguring. "I'm very thankful to not have had melanoma!" she writes, referring to the most deadly form of skin cancer, which kills almost 10,000 Americans each year. A study published last year found that getting five or more blistering sunburns before age 20 may increase a person's melanoma risk by 80 percent. And yet millions of teens are either unaware or ignoring the risk. The Centers for Disease Control and Prevention says 21 percent of high school girls used an indoor tanning bed at least once in the past year. "Skin cancer is not always moles, only one of mine have been a mole. Get any suspicious, new and growing spot checked out. Anything that doesn't heal, possibly bleeds on and off and crusts. The sooner you find it the less likely it will leave a disfiguring scar or grow deep enough to metastasize," she writes. "Melanoma kills, non melanoma disfigures (and can also kill). Don't be a statistic!"